A version of this article appeared in print on February 6, 2011, on page 1 of the Arts & Leisure section. WHEN the Denver Art Museum's signature American Indian art galleries reopened last weekend after a seven-month overhaul, the biggest change wasn't the new display cases or the dramatic lighting. Rather, it was in a less obvious place: the wall labels. For the first time, many of the works on display are attributed to individual artists instead of to just their tribes. It is a revolution in museum practice that many scholars hope will spread, and in the process raise the stature of American Indian artists and elevate their work from the category of artifacts to the more exalted realm of art. So the museum's "Wild Man of the Woods" mask, made in 1900 and previously identified only as "Kwakiutl," will be attributed to Willie Seaweed, a Canadian carver who died in 1967. In another gallery an exhibition of more than 30 pieces of pottery will celebrate the extraordinary skill of Nampeyo, a Hopi woman born around 1860. Other objects, thought to be the work of single unknown creators — like a selection of Navajo "eyedazzler" weavings dated 1885-1900 — will be grouped together with labels reading, "Artist not known." Art museums have collected American Indian objects for decades, but, like natural history and anthropology museums, they have tended to treat them as ethnographic pieces, illustrative of a culture. Wall labels have generally steered clear even of the "anonymous" designation commonly used for Western artworks of unknown authorship and in cases where Indian artists left signature marks — as Chilkat weavers of the Pacific Northwest long have, for example — this evidence has often been ignored. Nor did the early collectors of Indian art care much about authorship. To cite one example, George Gustav Heye, whose collections form the core of the Smithsonian Institution's National Museum of the American Indian, routinely bought pieces without noting anything other than the tribe and date. But Nancy Blomberg, the curator of native arts at the Denver Art Museum, was determined to do things differently when she reconceived the galleries, choosing nearly 700 works from the museum's world-class 18,000-piece collection. "I want to signal that there are artists on this floor," she said. Although some museums have made scattershot efforts to identify the artists behind pre-20th-century Indian pieces, the Denver museum has now embraced attribution more completely and comprehensively than any other institution. Ms. Blomberg's message begins in the introductory panel, which celebrates the individual artists on the floor, and continues in the labels beside the artworks, for which she drew on her own work and the research of other scholars. With excitement in her voice she told of one recent discovery. Last June she was paging through a Bonhams & Butterfields auction catalog when two ink-and-watercolor paintings caught her eye. One showed the Sun Dance of the Ute people; the other, the Ute Bear Dance. The Denver museum has owned a work that was clearly by the same artist since the 1930s, but it had entered the collection with no information about its origin. 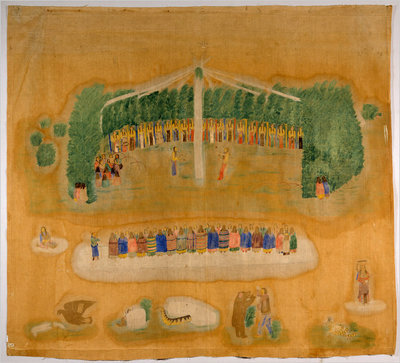 Ms. Blomberg had shown it to Indian tribes in Colorado, but none could shed light on its authorship. She had also seen other paintings that were obviously by the same hand at other museums, including the Peabody Museum at Harvard. "No one had any idea where they came from," she said. But the Bonhams catalog did. It said that both paintings were "signed upper right" with "Fenno." And it included a reference to a 1911 newspaper article about a log-cabin trading post in Myton, Utah, that was once owned by the great-great-grandfather of the paintings' seller. It said that Louis Fenno — "the greatest of Ute artists" — was shot to death in 1903 by a clerk named W. T. Muse, in murky circumstances. Fenno now lives again in a wall label that Ms. Blomberg has written for the refurbished galleries. And someday soon, he may be restored to posterity at the other museums that own his works. "Recognizing that Native American art was made by individuals, not tribes, and labeling it accordingly, is a practice that is long overdue," said Dan L. Monroe, executive director of the Peabody Essex Museum in Salem, Mass., which has a large Indian collection and has made some attempts to identify individual artists since the mid-1990s. Continuing to follow past practices, he added, "perpetuates a set of ideas, values and historical practices laden with racism, ethnocentrism and tragic and destructive government policies." Still, Mr. Monroe, who could not say how many of his museum's Indian works have so far been attributed, conceded that there are serious obstacles to the process. "The research required to identify individual historical artists is complex and time-consuming," he said. "We will continue to chip away at it, as will others." It's no mystery why museums haven't broadly adopted attribution research. Most are short on money and people, and many have other priorities. Robin K. Wright, the director of the Bill Holm Center for the Study of Northwest Coast Art at the Burke Museum, University of Washington, said that "museums are notoriously slow to change their labels," typically waiting for full-scale reinstallations. "In some places they haven't changed in decades," she added. At the same time, Indian objects are scattered around the country, yet a scholar must analyze many before reaching conclusions about authorship. And when they do, they publish their work in scholarly journals, sometimes neglecting to inform the very museums whose collections they may have studied. (Ms. Blomberg conceded that she has not yet informed the museums who own paintings by Fenno of her discovery.) Finally, while the task of rediscovering long-lost artists is enormous, "the field of people doing this is small," said Kate C. Duncan, an Arizona State University professor who once headed the Native American Art Studies Association. The roots of the attribution movement go back to the 1960s and to Bill Holm, now 85 and curator emeritus of Northwest Coast Indian Art at the Burke Museum. An artist himself, he created a vocabulary for speaking about form in Northwestern Indian art, and he began to identify individual hands through their signature stylistic characteristics. Following Renaissance art scholars, he also coined names. Just as the creator of an altarpiece in the Uffizi Gallery in Florence is called the "Saint Cecilia Master," the maker of a 19th-century Haida chief's beautifully carved chair in the Field Museum in Chicago is the "Master of the Chicago Settee." Soon Mr. Holm, and a few others in his generation who studied the work of tribes in other parts of the continent, attracted followers. In the 1970s and '80s, for example, Ms. Wright studied Haida pipe carvers of the Pacific Northwest as a student at the University of Washington and named the "Master of the Long Fingers" and "Master of the Fat Round Ovoids." Later she focused on three 19th-century Haida artists — Simeon Stilthda, John Gwaytihl and the "Master of the Chicago Settee" — and was able to link masks, totem poles, wooden works and headdresses to them. Using Haida genealogy records and other unpublished 19th-century documents, she also discovered that the "Master of the Chicago Settee" was a man named Zacherias Nicholas. Elsewhere around the country other scholars have done attribution research on other tribes. What they do is painstakingly slow and often tedious. 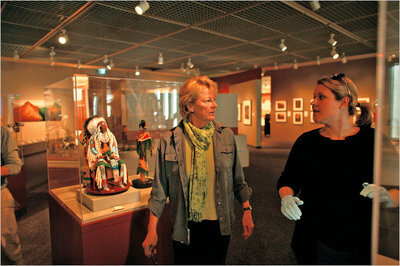 To identify stylistic idiosyncrasies of "lost" artists, Valerie Verzuh, a curator at the Museum of Indian Arts and Culture in Santa Fe, N.M., has spent many hours assessing Southwest Indian pottery, considering the designs, kinds of paint used, brush strokes, rim finishings and even the precise thicknesses of the clay. Looking at Plains Indian beadwork, Ms. Blomberg focuses on details like the number of beads that lie between stitches. Their work is also subject to revision. Since 1948, for example, the Denver museum has owned a headdress first identified as Tlingit or Bella Coola (a.k.a. Nuxalk). Years later, thanks to Mr. Holm, it was relabeled as a Haida work, and later still it was attributed to the Haida artist Albert Edward Edenshaw. But the advances can be exhilarating. Kathryn Bunn-Marcuse, who also teaches at the University of Washington and who has looked at "thousands and thousands" of 19th-century silver works, tells of such a moment. In 2007, while speaking at a clan conference of the Tlingit, she showed a list of about 70 names of artists that she and a colleague had discovered in 19th-century documents. "People came up to me afterward and said, 'That was my great-grandfather,' or 'That was my great uncle,' " she said. Some owned works that are helping her associate the hands she has identified with names. Slowly, label by label, this matching of artist to artwork is seeping into museums. The Seattle Art Museum reorganized its Northwest Coast Native American galleries in 2007 around the theme "The Artist Behind the Art," adding every attribution it knows, including a raven screen by a Tlingit named Kadyisdu.axch that dates to about 1810. When the New York branch of the National Museum of the American Indian opened a new installation last year, two works were newly attributed, according to Ann McMullen, a curator. One is a painted drum created around 1860-70 by a Yanktonnai Nakota named Black Chicken; the other is a yarn bag made about 1900 by Ska-ba-quay Tesson, a Meskwaki Indian. Even at history and anthropology museums change is afoot. Peter M. Whiteley, curator of the Hall of Northwest Coast Indians at the American Museum of Natural History, said he has no current plans to add artists' names. But he added, "If we are able to get to the stage of reinstalling the hall, it would certainly be good to identify the artist wherever it is salient."